If you already have a grill, why not go one step further and create a full outdoor kitchen? An outdoor cooking area will limit indoor foot traffic and give you access to prep and cleaning stations. Also, outdoor kitchens will help you organize condiments, drinks, silverware and plates. Creating an outdoor kitchen isn’t as intimidating as you may think. Use old cabinets as the centerpiece of your outdoor cooking space. Stack extra plates, plastic silverware and cups on the shelves inside the cabinet. You can also incorporate a small refrigerator in your designs. Drill a hole in the back of the cabinet for the cord and plug it into an outdoor-approved outlet. Lastly, stock it with your favorite beverages and a full array of condiments. Give your backyard a boost of tranquility with the peacefulness of a backyard pond. There is nothing quite as relaxing as spending time with family in your own backyard oasis. A wide variety of pre-formed shapes and sizes make installing a backyard pond simple. Just dig your hole, install the pond form, backfill the dirt and add a ready-made filtration system. Once that is in place, all you need are fish and a few floating lily pads. Installing a great patio is the perfect way to start enjoying the exterior of your home. Once the ground is leveled, it is mainly a matter of laying down the patio blocks and locking them into place. You may need a bit of help from your friends and family, but once the patio is ready, you can stand back and admire your work. Lower temperatures don’t mean you have to go inside. You can enjoy the great outdoors no matter how cold the weather is with the warmth of a fire pit. There are a number of fire pits on the market, including some premade, stock-and-light models. If you want a more do-it-yourself project, you can dig a pit in your backyard and stack the stones to create a unique look. A backyard gazebo can provide a private, romantic getaway. There is nothing like warming up in a cozy gazebo on a cold winter night or relaxing in your own private space after a hard day at work. There are plenty of gazebo plans available online, but you can also DIY your own designs. Hot weather can make it difficult to enjoy your deck. Install a retractable awning to shed some shade on your decking and make warm weather gatherings a breeze. 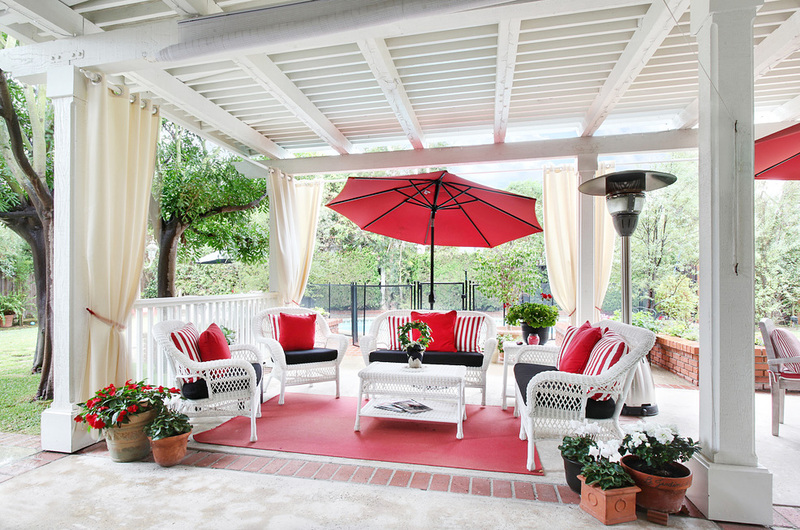 A retractable awning can cool your deck by 10 to 20 degrees and shade guests from rain. Insects can take the charm out of any outdoor living space. Flies, mosquitoes, mayflies and other troublesome pests can destroy your deck, make your patio uninhabitable and ruin outdoor meals. Enhance your outdoor living space by creating a bug-free zone. Set up citronella-filled tiki torches around the perimeter of your deck and patio to send mosquitoes packing. You can also hang flytraps in the trees or install a bug zapper to fry troublesome flying insects. Adding an outdoor living space is the perfect way to make your home more livable. You can enjoy a cookout with your family, sit around the fire and tell ghost stories or just hang out by the pond and commune with nature.